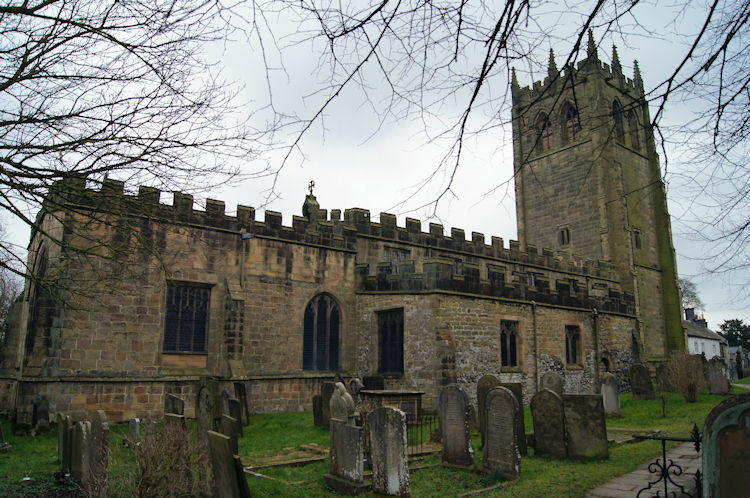 Summary: Harthill Moor and Stanton Moor are located just west of Darley Dale, a few miles north-west of Matlock. They are both covered in sites of archaeological interest. 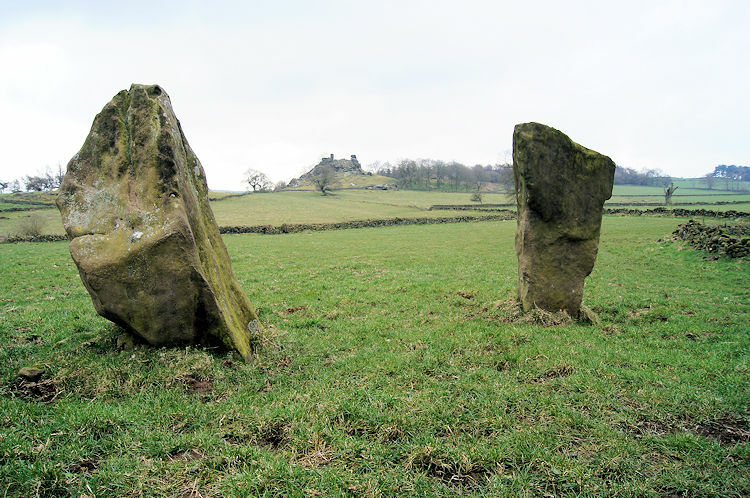 On Harthill Moor there is a castle ring, stone circle, rock pinnacle and hermit's cave. On Stanton Moor there is a single standing stone popular with the local community and one of the most impressive stone circles in the Peak District. 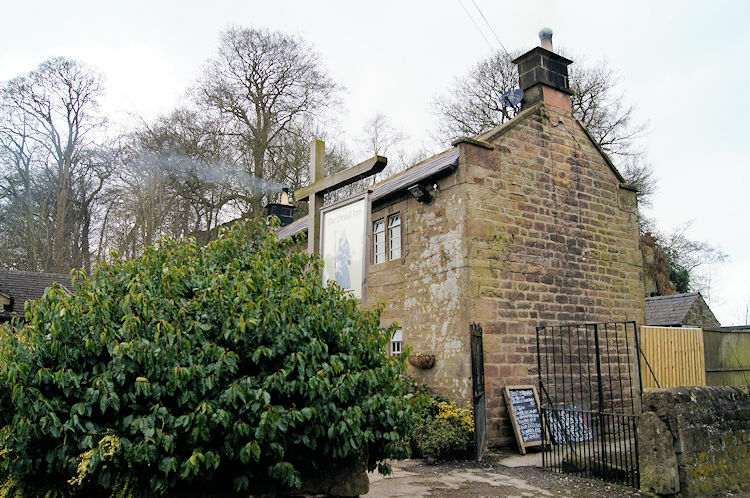 Besides the ancient sites the walk crosses wonderful Peak District countryside and passes through four lovely villages. The Walk: I like to enjoy walks of different character. During a three day break in the Peak District this was the third. The first had been in the Monsal Dale area which included the Monsal Trail, a relic of the Victorian Industrial Revolution and several Victorian Mills which were now converted into dwellings. 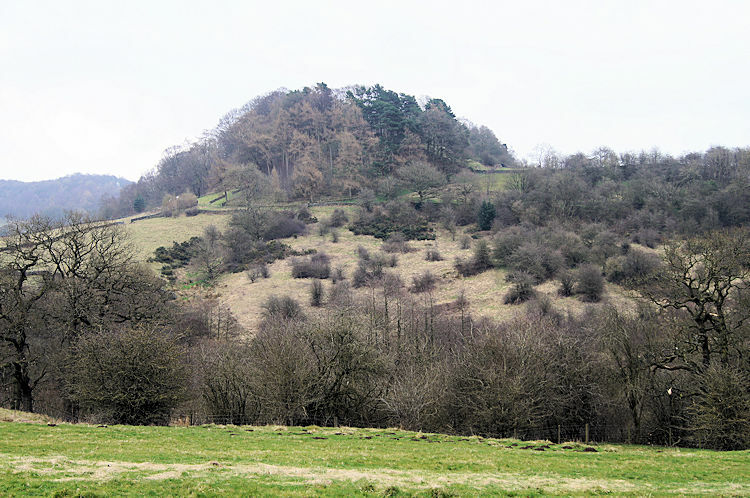 The second walk to the Great Ridge and Win Hill was utterly devoted to the magnificent natural landscape of the central peak while this third and final walk in the Peak District, for the time being at least, was dedicated to my passion for seeking out the ancient and very old. There was much to look for in my chosen route across two moors of the National Park. I began my exploration from the village of Youlgreave. The walking break in the Peak District in mid March had not blessed me with much sunshine though at least it had not rained during my first two walks. 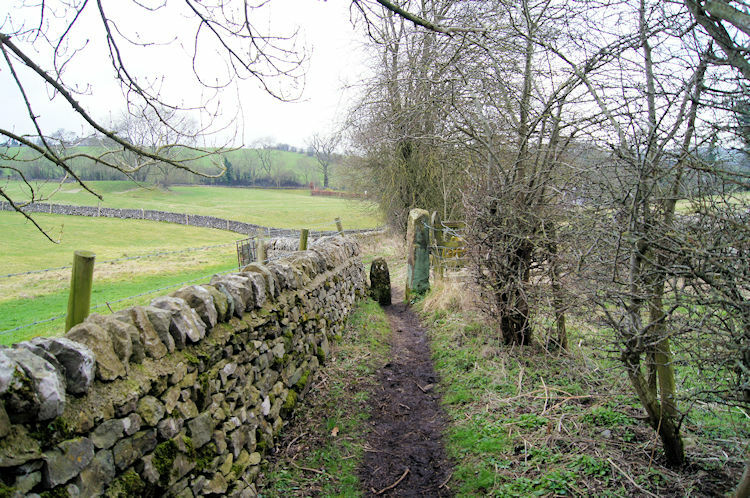 Nor was it raining as I set off from Youlgreave by walking on the public footpath through the village churchyard and down the village lane to join the Limestone Way beside the River Bradford. It was not forecast to either though the heavy blanket of grey cloud overhead showed little sign of breaking up. It was a cold morning and I walked briskly to raise the warmth within my thick winter clothing. A steady climb from Youlgreave on the path south across a series of fields guaranteed the temperature within my winter shield would rise. And so it did. 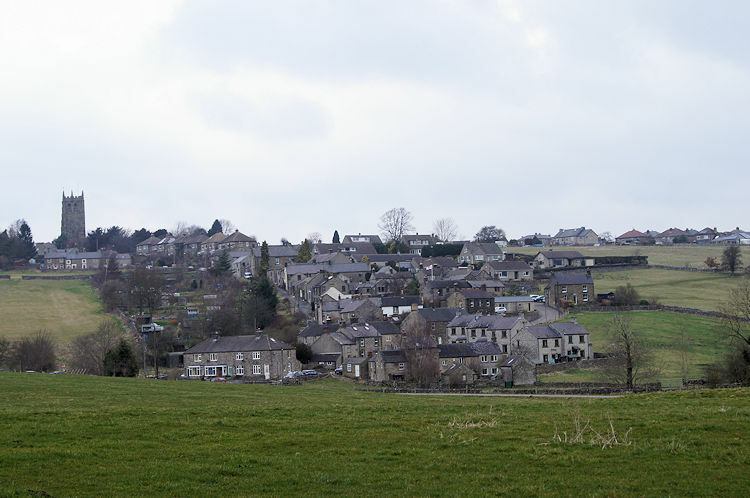 Though I kept my hat and gloves on a glow of warmth spread quickly over me as I briskly climbed from the River Bradford in a south-east direction from Youlgreave, first dipping down and over Bleakley Dike and then sharply uphill to Round Wood. There were no trees in the wood though, it was wild pasture. Even the fence line had disappeared isolating a stile completely. All that kept it company was a solitary gnarled Hawthorne. Woodland was to the left and right of me but the gap had been breached. After what was once Round Wood I crossed the hump of a small rounded hill and descended to a fence line, the boundary of fields. This one was intact and the stile provided had to be crossed over, unlike the abandoned one on the other side of the hill. Once over I was necessitated to make a stiff climb up the field to the site of an old castle ring near to Harthill Moor Farm. The turf banks of the castle ring are topped with a drystone wall and with the steepness of the hill approach it is clearly a castle ring which would give ample warning of attack and thus should have been well defended. After viewing the site I followed the Limestone Way through the farm and down the farm access road to the Elton to Alport public highway. 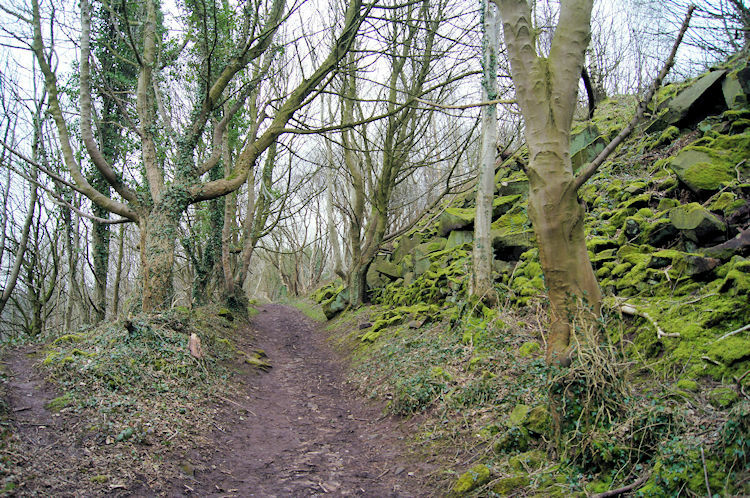 The path took me straight across the road and into a field leading directly to the rock outcrop of Robin Hood's Stride. However at the north-east end of the field I saw a stone circle and could not resist the temptation to visit. It is called Nine Stones Close though only four stones remain of what once was a 45-foot circle of stones. 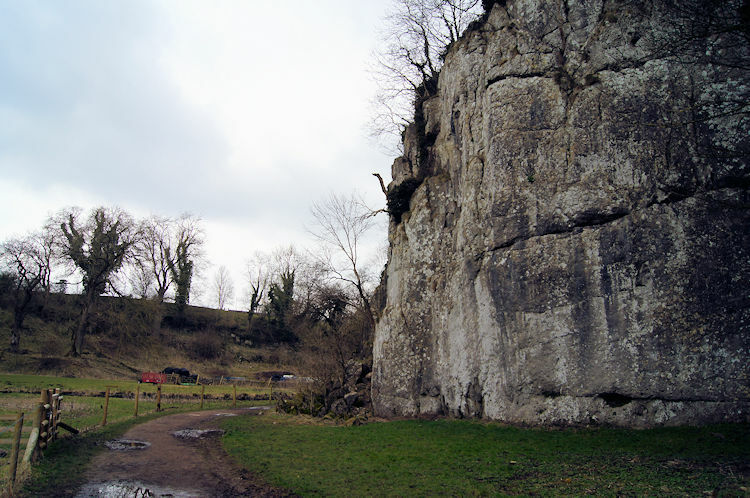 The stones are the tallest in Derbyshire, ranging from 4 feet to 7 feet in height. What a shame that the farmer chose to site an ugly trailer in the centre of the site, filled with stinking unwanted sheep fleeces. I admired the stones, I loathed the disrespect. 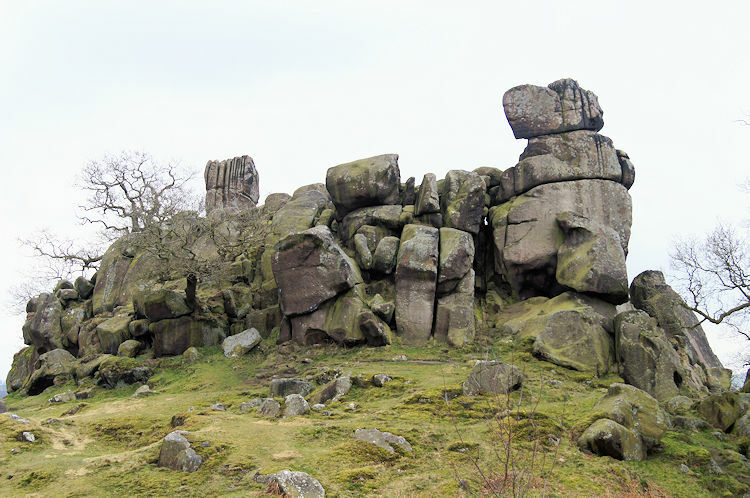 From the stone circle I rejoined the Limestone Way and walked directly to the outcrop of Robin Hood's Stride, a spectacular tor of gritstone rocks perched on a ridge at the edge of Harthill Moor. Legend has it that Robin Hood strode between the tower-like stones at either end of the tor. Perhaps it was Little John? Whether the legend is to be believed or not the rock outcrop simply invites exploration. I clambered to the top and back down again by one of the easiest routes. I was not in the least tempted to stride across any gaps. After clambering down from the outcrop I crossed a field to reach another gritstone outcrop. 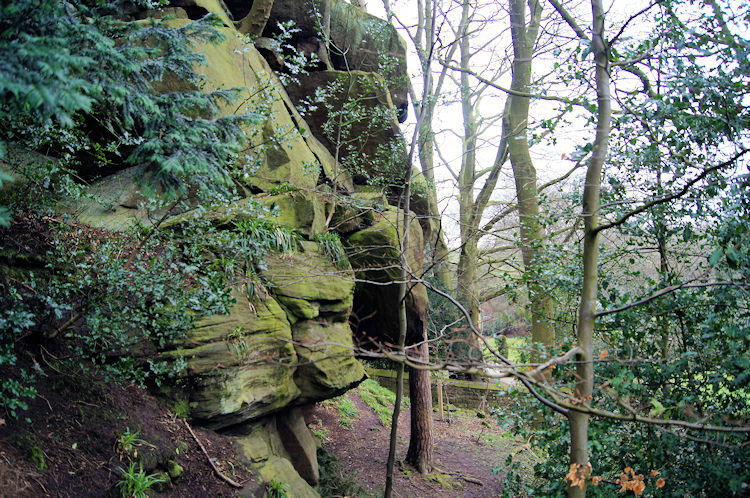 This outcrop, Cratcliffe Rocks, was reputedly once the home of a Hermit. I found the Hermit's Cave by the base of the rocks on the south side. 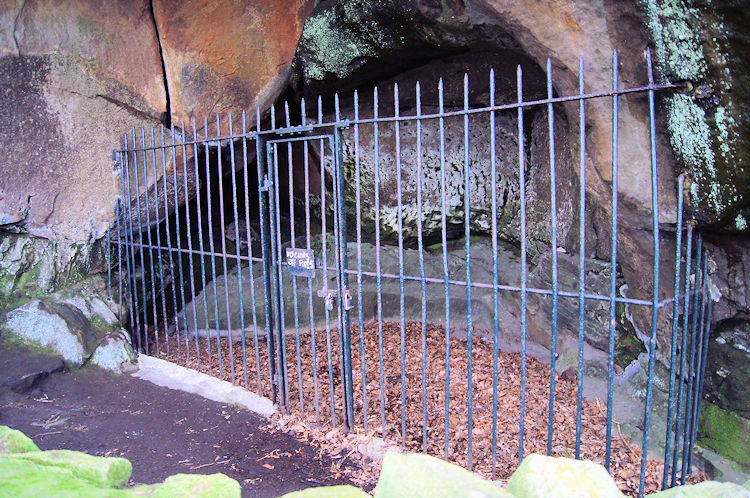 It is now protected by railings as there is a religious carving inside which has previous attracted vandals. Apparently occupation by hermits, of which there are suggestions of being several, dates back to at least the 14th century. Whatever the truth the cave is in a lovely secluded spot at the base of the outcrop and amidst trees, some of them ancient Yew. I could easily spend a night in such surroundings. 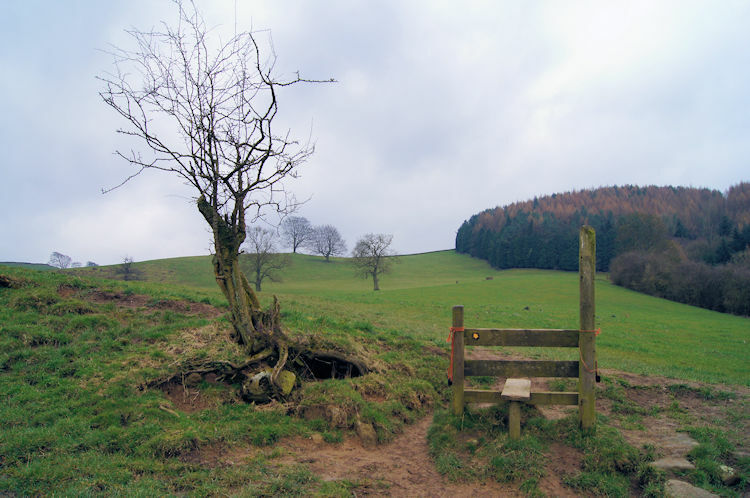 After the excitement of exploring castle rings, stone circles, gritstone outcrops and hidden caves the next stage of the walk was a bit of a lull as I left Harthill Moor and headed across country, over the B5056 road and up and around a small hill towards the village of Birchover. On the way I met a group of Peak District Ramblers enjoying their regular Sunday walk and then a family with two teenage girls trying to coax a young white horse into it's box. The horse was not happy. After these encounters I reached Rowtor Rocks and took a little exploration of them. Retreating from Rowtor Rocks from the same place I had entered I walked into Birchover from the west, past the small village chapel and then when I reached the village main street I turned left to pass the Druid's Inn and once past the pub I turned right to leave the road and walk through Barton Hill Wood. I found the walk through the woodland a delightful one. At a suitable spot just off the path on a raised bank I stopped for a coffee break. It was warming, though I had not thought about the cold of the day since my instant warming on leaving Youlgreave, once I had stopped I walking I cooled quickly and the hot drink compensated perfectly. After coffee I continued on my way. Soon after my coffee break the delightful footpath through Barton Hill Wood came to an end at a car parking area near to Stanton Park Quarry. I turned left at the car parking area to follow the road about 100 metres before turning right to leave the road and approach Stanton Moor. First I walked through a small section of woodland but after reaching a gate I walked through it onto open moor. Immediately I banked the thought that Stanton Moor was unlike Harthill Moor. Though neighbouring each other Harthill Moor on a plateau height of around 240 metres is mostly farmed. Only the enclosed areas around rock outcrops such as Robin Hood's Stride and Cratcliffe Rocks retain moorland grasses and heathers. 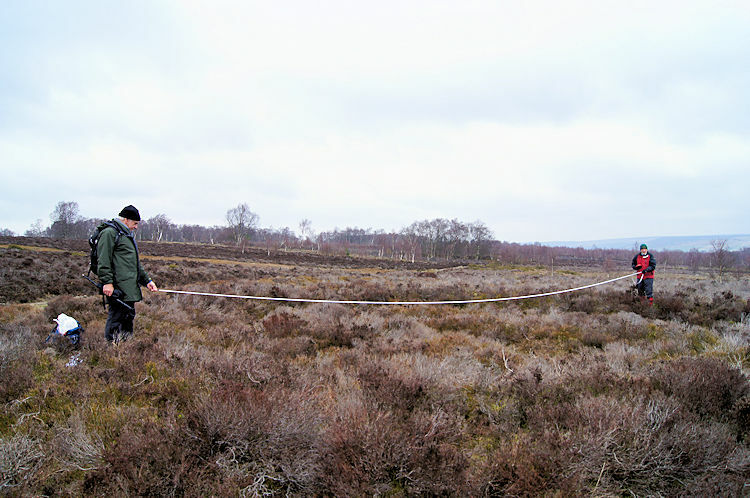 Stanton Moor at a plateau height of around 300 metres is all typical moorland in character. There is no attempt to farm here, 60 metres in difference has ascertained that. Not without trying though, there is ample evidence on Stanton Moor that efforts have been made to tame it. 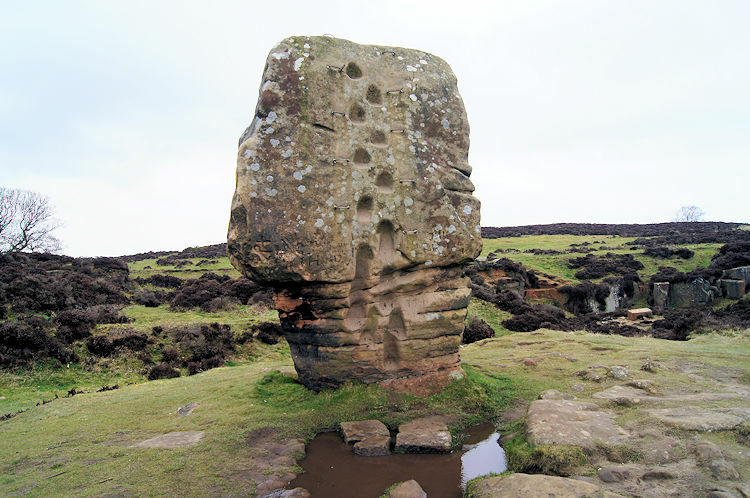 First evidence came at the Cork Stone, a single standing stone which has been cut out with foot holes on the south face to allow people to climb it. And metal hand grips have been fixed in beside the foot holes to make the climb easily manageable. Then soon after leaving the Cork Stone I came across three mature people with a tape measure. They were measuring the size of a stone circle which was overgrown with thick heather. The leader of the group was the illustrious pensioner Mr Vince Boulter who was studying ancient stone circles as part of his Archeology Degree. 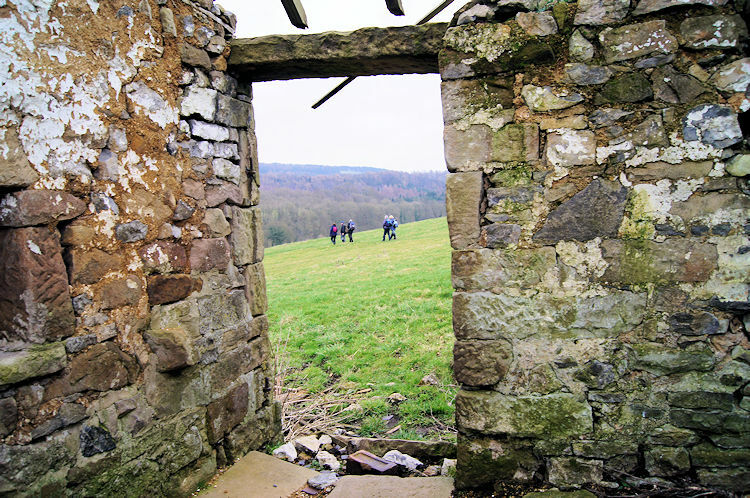 In a previous venture he originally researched and designed the Sheffield Country Way. He told me people had attempted to farm the moor for centuries and a little further on my walk I would find another, more obvious ancient site. 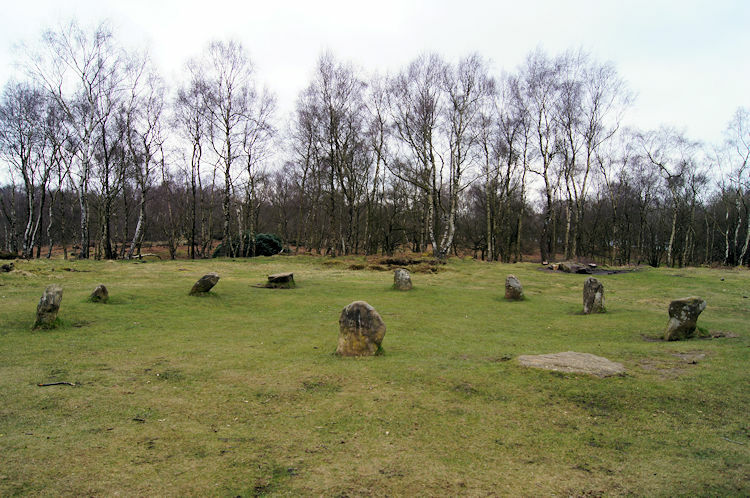 And true to his word, though I knew it already, I came to Nine Ladies Stone Circle, an early Bronze Age stone circle traditionally believed to depict nine ladies turned to stone as a penalty for dancing on Sunday. The tales some people come up with? Whatever the real truth of its origin the stone circle is in a lovely open clearing surrounding by birch woods. A tree standing alone from the rest and nearest the stone circle was covered with coloured ribbons. People of certain faith must still worship here. After walking around the ancient site I left it and Stanton Moor behind to its untamed certainty by walking north-west on a good path to Lees Road. This metalled roadway took me to Stanton in Peak from the east. 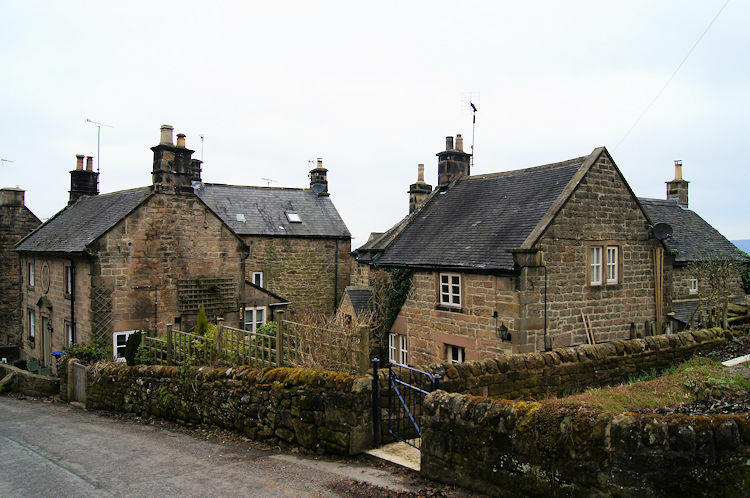 I walked from east to west through the delightful village, one full of chocolate box cottages and some grander houses. As I walked along the street I passed another group of ramblers out for a Sunday walk. By observing their gestures as we crossed paths in the village I think they were as impressed with Stanton in Peak as I was. After leaving the boundaries of Stanton in Peak I walked along the village access road to cross the A5056 for a second time. 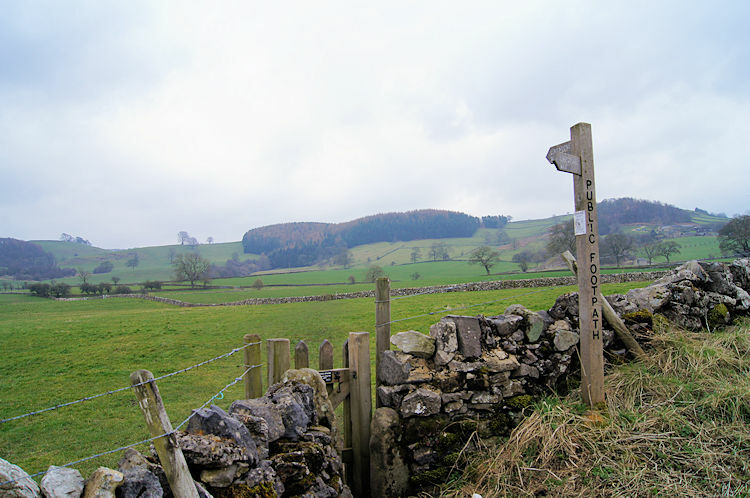 Immediately on crossing the road I climbed over a stile and entered a field cutting a north-west path towards Alport. In the centre of the village was a crumbling old barn but with walls sturdy and safe enough to provide shelter from the cold breeze while I took my lunch break. And so I did. While eating my delicious sandwich, like all sandwiches are when famished during a walk, a third group of ramblers passed by my way. I looked out from my temporary shelter and waved. Some of the group waved back. No words were passed between us, just the friendly gestures. After lunch I continued on the path to Alport, part of it through a Static Caravan site and another part of it closely beside another Static Caravan site. Nobody was around, both sites were still. 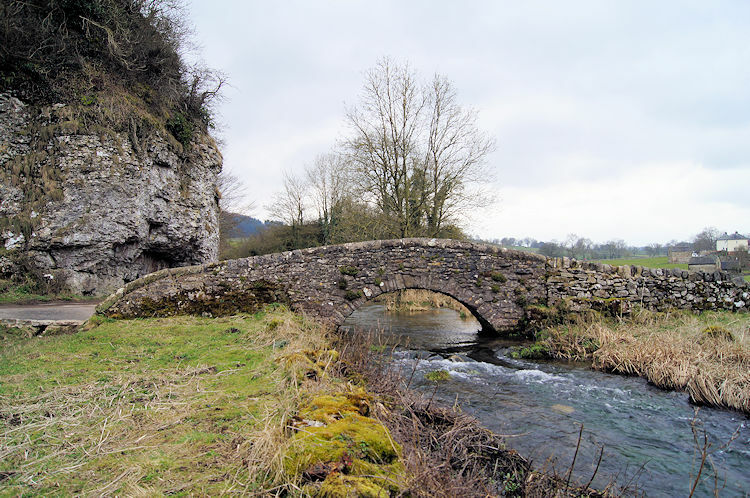 I reached Alport, another lovely village where the River Bradford flows into the River Lathkill. From Alport I followed the River Bradford upstream and past some impressive limestone cliffs, some of them vertical. On my way from Stanton Moor to here I had crossed a gritstone/ limestone boundary but where exactly I was not sure. 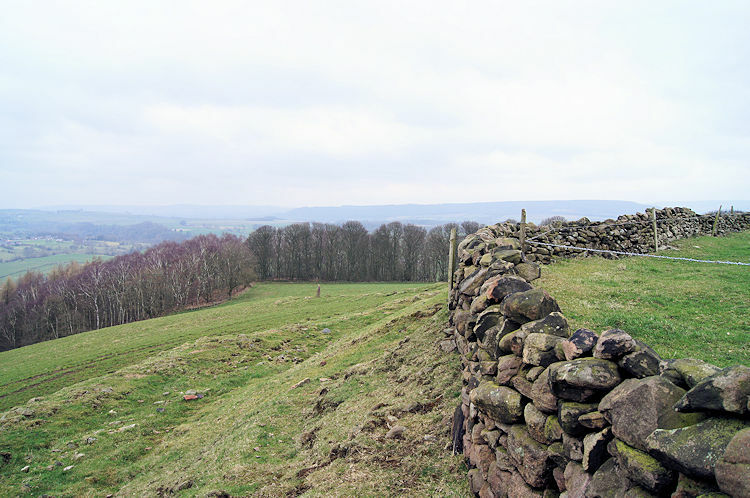 It must have been close to or in Alport though as the land around Stanton in Peak had outcrops of gritstone. The walk on the path between the limestone cliffs on my left and the river on my right was a lovely finale to the walk. Quite a few people, some individual, some couples, and some families were enjoying this stretch of path between Alport and Youlgreave too. All too soon, in just a half mile, I came to the end of my walk along the river and crossed a gorgeous stone bridge which led me back up into Youlgreave. My walk in search of history was done, a delightful walk I shall treasure until I am ancient too.